I spend my life in McLean Virginia and in Frankfurt am Main. When I am in Frankfurt am Main, “Feinschmecker’s” on Alt Schwanheim in Frankfurt’s suburb Schwanheim is my “down the road” Bistro. It is owned and run by Marina Meixner and Nenad Baretic, a charming couple from Schwanheim, who do most of the cooking and servicing themselves. What people often don’t know is that (1) Frankfurt am Main is the city of cider and (2) Frankfurt am Main is very close to the Rheingau and Rheinhessen, two of the leading German wine growing areas, with many wine taverns and wineries. In Frankfurt am Main, there are many cider taverns all around the city, where people sit at communal wood benches, drink cider out of Frankfurter Bembel (Mug) and eat hearty Frankfurter food. This includes the famous choucrute, Frankfurter Handkaes, Gruene Sauce. In the suburb, where I have my residence, the cider tavern to go to is the Frankfurter Hof on Alt Schwanheim, just a few blocks down the road from the Feinschmecker’s. This is a true gem – of which there are many in the different suburbs and the city. Frankfurt is just 30 minutes away from the Rheingau and Rheinhessen, but you do not find wine taverns in Frankfurt, as you do for example in Mainz, where there are plenty of them. If you are in Frankfurt and want to drink Rheingau wine, take the S-Bahn from the central station or the airport and go to Mainz or the village of Hochheim. When I am not up for cider or for a trip to a wine tavern in Mainz, my place to go to is the Feinschmecker’s. With a modern, eclectic look, Feinschmecker’s has a mostly Mediterranean menu. There is a communal bar with seats in the center of the Bistro, which I like very much. Feinschmecker’s is a wine bistro and café that is open all day long. It serves a variety of breakfasts – including Italian, Spanish and French - in the morning, for Euro 5 to 7. For lunch it has, in addition to the regular menu, always two specials, such as a Spaghetti dish and a fish dish, typically in the Euro 6 to 7 ranges. In the afternoon, it is again coffee time. And in the evening, people come just for a drink or to eat dinner. The food is cooked in a small corner of the Bar area. The choices are limited but excellent and include hot food. Feinschmecker’s offers a nice list of what Marina and Nenad call tapas, both cold and warm, which include olives, Serrano ham, dates wrapped in ham and large, juicy shrimps. The tapas are in the Euro 3 to 4 range. I like the various options of “Flammekuchen” a specialty from Alsace and the “baked potatoes” which are served with cream or other toppings. My Canadian friend always eats steak and he loves it. My wife typically has the Cremant d’Alsace, brut, a very nice sparkler from neighboring Alsace. I usually try a couple of glasses of the about a dozen wines he offers by the glass. The wine card is essentially comprised of international wines, both old and new world wines, including some German wines. These are no spectacular wines, but good, decent day to day wines. Don’t expect a Chateau Palmer or a young talented winemaker in the Rheingau, which is on the verge of being discovered,but the AC Bordeaux he has will be honest and good. Nenad is a charming fellow, borne in Serbia, but as German as a German can get. My son lives in Belgrade and we always exchange notes about what is happening there. From time to time I see people coming from the airport and I am wondering why not more passengers who have to kill a couple of hours do not come to the Feinschmecker’s in Schwanheim. It is 10 minutes by cab – without any traffic light. It is clearly the most international and intellectual place in this part of Frankfurt – in the South-West, close to the Frankfurt Airport. Very often I meet people there with an international background and interested in a conversation over a glass of Spanish or French wine, such as my new friend Pierre from Canada. It caught me pretty much with surprise, when I read that Nyetimber's Classic Cuvee 2003 had been crowned champion of worldwide sparkling wines in the 2nd annual "Bollicine Del Mondo" competition in Verona, Italy, impressing judges more than sparklers from French legends such as Bollinger, Pommery and Louis Roederer. In all, 52 wines were tasted blind by a panel of oenologists, winemakers, sommeliers and journalists at the competition which is run by Italy's wine magazine Euposia. This is clearly part of the changes that are going on in the global wine market. New wine countries are emerging. They are emerging for two reasons. Some of them are benefiting from climate change as the northern border for wine growing is pushing up. Others are emerging countries and with the general economic expansion, the demand for wine and the production of wine is also going up. England is a prime example of an emerging wine country because of climate change. Many eastern European countries are emerging wine countries. Hungary, for example, has a long tradition of wine making and at some point in its history it was among the top wine producers of the world. But it lost contact to Western Europe as a result of the iron curtain and fell back, but is now clearly reemerging as major wine producer. Slovenia has reentered the international market quickly after the collapse of Yugoslavia in the mid-1990s and is producing now outstanding wines. Croatia is a bit behind, but has excellent potential. Serbia still has a long way to go. Poland has never been a major wine producer, but may benefit from climate change. The UK now ranks a lowly 63rd on the list of the world’s wine-producing countries, but Nyetimber confirmed what many experts have been saying for some time: UK sparkling wines can compete internationally. What is Nyetimber? For all the innate Englishness of the Nyetimber Manor Estate, Nyetimber as a commercial vineyard has always enjoyed international influence. A couple from Chicago, Stuart and Sandy Moss had the unusual ambition to find a location outside France where it would be possible to produce sparkling wine to rival champagne. They established Nyetimber Manor Estate in 1986 and - amid much industry skepticism - began the vineyard planting in 1988, using the three classic champagne varieties, Chardonnay, Pinot Noir and Pinot Meunier. In 2001 the Mosses decided to retire back to the States and sold the Nyetimber Estate to the songwriter and record producer Andy Hill as a rural retreat. 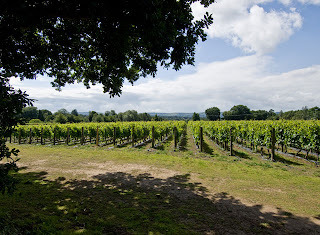 Nyetimber’s present owner, Eric Heerema, bought the Nyetimber Estate in March 2006. It is now the largest vineyard estate in the UK at 350 acres under vine. Nyetimber brought English (sparkling) wine on to the world map. Will other countries follow? Russia used to produce famous sparklers, but the industry has suffered badly from many decades of communism. Germany is one of the largest sparkling wine markets in the world, but not among the stars, although outstanding sparkling wines are increasingly produced in Germany. One out of four bottles of sparkling wine is consumed in Germany, roughly 500 million bottles. Sekt is made in all German wine regions, both in the méthode traditionnelle and charmat method. Increasingly, there are a number of top quality winemakers, who, in addition to their still wines, have started to include Sekts in their portfolio. These Sekts are typically vintage Sekts, from a specified vineyard, made of specific grapes, often Riesling, in the méthode champenoise and with little or no dosage (brut or extra brut). Saint Valentine's Day: French Champagne, German Sekt or Virginia Sparkler! 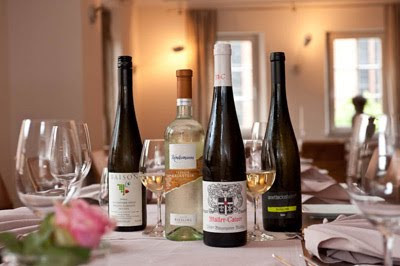 The Food and Wine Journal Der Feinschmecker and the German sparkling water producer Apollinaris have for the second time, done a ranking of Germany’s restaurants in terms of their selection of German wines. A total of 120 restaurants participated in the contest of which the following 10 were selected. The other day, a friend of mine sent me an e-mail asking me where he could have a good selection of German Rieslings, while on a stopover in Frankfurt am Main. This list is a good starting point, although I am not sure how broad the participation in the contest was. In Berlin, for example, I would definitely also recommend Restaurant Rutz. I do not know, whether they did not bother to participate, or if they did, but did not make it to the top 10. Anyway, here are the top 10. Restaurant Quadriga in the Hotel Brandenburger Hof - this year’s number 1, with 1250 German wines in the wine cellar. Restaurant First Floor in the Hotel Palace – one star Michelin cuisine. Restaurant Kronenschloesschen in Eltville – Hattenheim; exquisite restaurant, which also got a special award for having a selection of 800 wines from the Rheingau. Weinhaus und Hotel Zum Krug in Eltville – Hattenheim – more an up-scale wine brasserie in the same village in the Rheingau serving traditional German specialities with a staggering wine list, which includes their own wine. Restaurant Die Insel – exquisite restaurant with also an amazing list of top French wines. Restaurant Falco in the Hotel Westin. Restaurant Weinhaus Gut Suelz in Koenigswinter – a cosy wine brasserie with wines from 70 German producers. 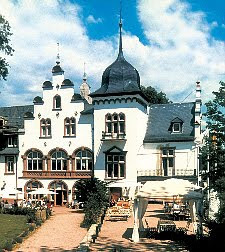 Kucher’s Landhaus in Darscheid – a wine cellar of 20.000 bottles in the country side, between Bonn and Frankfurt am Main. Restaurant Friedrich von Schiller, Bietigheim-Bissingen – about 30 miles away from Stuttgart in the country side; I can recommend their Schillerwein; former Boss of Porsche Wendelin Wedekind is a regular here. Restaurant Gut Laerchenhof, Pulheim – Stommeln – an elegant restaurant, which is part of a golf club. The roots of Chateau Mouton-Rothschild – and the Rothschild empire in general – are in Frankfurt am Main, Germany. Towards the end of the 18th century Mayer Amschel Rothschild, a money changer from Frankfurt am Main, born in 1744, had five sons and decided to install them in the five major European centers of the time. The Rothschild brothers became one of the major force in the far reaching changes that swept through Europe, while their father had not been allowed to purchase land outside of the Frankfurt am Main ghetto. During the 19th century, they were the bankes to monarchs and governments, bankers to Napoleon’s Europe and then in the industrial area the builders of the modern economy through their investmet in railways. Interestingly, the other great son of Frankfurt, Johann Wolfgang von Goethe (28 August 1749 – 22 March 1832) was born only a few years later and also had a tremendous influence on Europe. Goethe is considered by many to be the most important writer in the German language and one of the most important thinkers in Western culture as well. Goethe is the originator of the concept of Weltliteratur ("world literature"), having taken great interest in the literatures of England, France, Italy, classical Greece, Persia, the Arab world, and others. Goethe's influence spread across Europe, and for the next century his works were a major source of inspiration in music, drama, poetry and philosophy. Back to Rothschild and the high finances … and wine. Around 1850, Baron Nathaniel, from the English branch, decided to move to Paris. Entertaining the leading personalities of his day, Baron Nathaniel Rothschild, wanted to be able to serve them his wine. In 1853, Nathaniel Rothschild purchased the Chateau Brane Mouton in Pauillac, in the heart of the Medoc region. Rothschild quickly gave his own name to his new property, which became known as Chateau Mouton Rothschild. In 1868, Nathaniel's uncle, James Mayer de Rothschild acquired the neighboring Chateau Lafite vineyard. and the estate became Château Lafite Rothschild. Baron James, however, died just three months after purchasing Lafite. The estate then became the joint property of his three sons: Alphonse, Gustave, and Edmond. The vineyard purchase came just before the first official classification of the Gironde region wines. Unfortunately for Rothschild, the classification, presented on the occasion of the Universal Exhibition of 1855, was made according to price, not quality. Because wines from the Mouton Rothschild estate sold for slightly less than its famous neighbors--Lafitte, Latour, Margaux, and Haut Brion, which all received First Growth qualification--Mouton Rothschild was subsequently classified as a premium Second Growth wine. Yet neither Nathaniel, nor his son James, who inherited the estate after his father's death in 1870, took an active interest in running the vineyard. Nor did Nathaniel's grandson, Henri, who was to turn over the winery to his youngest son, Philippe, in 1922. Philippe Rothschild was to revolutionize the Bordeaux wine industry. Coming from Paris, where he had become a well-known patron and friend of the lively art scene in that city, the 20-year-old Rothschild arrived in a region with a business structure unchanged since the 19th century. Rothschild, however, took the running of the Chateau Mouton Rothschild estate in his own hands--and in doing so, sent a wake-up call to the entire region. From the start, Philippe Rothschild began to challenge the wine classification system, adopting the motto 'Premier ne puis, Second ne daigne, Mouton suis' (First I may not be, Second I will not be, Mouton I am). By 1924, Chateau Mouton Rothschild was ready to release its first self-bottled vintage. For the occasion, Rothschild commissioned popular poster designer Jean Carlu to design a label for the chateau. Carlu's cubist-inspired label shocked the wine community--Philippe Rothschild was to scrap the label design only two years later--but nonetheless succeeded in calling worldwide attention to the new era of Rothschild wines. In the years leading up to the World War II, the Rothschild chateau continued to experiment with its wine labels. In 1932, Mouton Cadet was launched, a very successful day-to-day Bordeaux wine that is available now around the globe. Disfied with the quality of the 1930 vintage, Rothschild refused to bottle the wine under the chateau's label. Yet because the wine was nonetheless of good quality, Rothschild created a new name for the wine: Mouton Cadet. The Cadet name, first released in 1932, was later to become a brand name for the wine blended by the company from grapes bought from Bordeaux region producers. The original Cadet vintages, however, were bottled from the family's own vineyards. Mouton Cadet proved a success and inspired Rothschild to expand the family's vineyard holdings to supply its growing production needs. In 1933, Rothschild acquired neighboring Chateau Mouton d'Armailhacq, then classified as a Fifth Growth vineyard. With that purchase the company also acquired the wholesaler company Société Vinicole de Pauillac, bringing Rothschild into the distribution arena and providing the basis for what was later to become Baron Philippe de Rothschild SA. France's capitulation to the Nazi invaders and the installation of the collaborative Vichy government nearly spelled disaster to the Rothschild wine business. The chateau itself was occupied by the Nazis and made a German headquarters, while the Vichy government placed operations of the vineyard under its agricultural department's control. Philippe Rothschild and his family were captured--Rothschild's wife was killed in a Nazi death camp--but Philippe Rothschild managed to escape, finally joining up to fight with the Free French army under General Charles de Gaulle. Rothschild, who had already been among the pioneers in recognizing the marketing potential of a wine's label, now decided that the label for each year's vintage was to feature an original piece of artwork--commissioned from Rothschild's circle of friends, only some of whom were artists. Yet all received the same payment: five cases from that year's vintage, plus five cases chosen from the Rothschild cellars. In 1955, the Rothschild label took on a still more serious role. That year's label featured a design from famed painted Georges Braque. From then on, the Rothschild labels were to become a showcase for the world's top contemporary artists, featuring, among others, drawing and paintings from Joan Miro, Salvador Dali, Henry Moore, Marc Chagall, Pablo Picasso, Andy Warhol, and later artists such as Keith Haring, Balthus, and others. The company expanded its production again in 1970, when it acquired another Pauillac Fifth Growth property, Chateau Clerc Milon. This and the company's other fifth growth chateaux became a central part of the company's increasingly diversified product, as it began to target specific markets, such as the restaurant, specialized retail, supermarket, and other segments, with specific labels. The company got a major boost in 1973, when, after nearly 50 years of pressure from Philippe Rothschild, the Bordeaux region was reclassified according to the quality of its wines. At long last, Mouton Rothschild was classified among the First Growth growers. The growing importance of California wines, which, under such names as Robert Mondavi, had been steadily increasing in quality, led Rothschild for the first time to branch out beyond France. 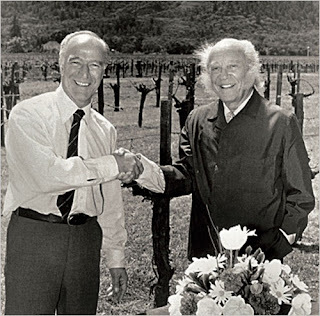 In 1979, Mondavi and Rothschild formed the joint venture Opus One. Bringing French oak casks and wine varieties and Rothschild techniques to California's Napa Valley region, Opus One was designed as a premium quality producer. Indeed, the new winery--led by Mondavi's son Tim Mondavi--quickly became classified among the world's top-quality wines. Philippe Rothschild died in 1988 at the age of 86. Philippine de Rothschild took over the chateau's operations. During the 1990s, Mouton Cadet became the company's spearhead into the mass market. Boosted by the Rothschild name, Mouton Cadet quickly became one of the world's top-selling branded wines, with more than 14 million bottles sold each year. Rothschild continued to look for new international opportunities. The growing maturity of the Chilean wine industry led the company to conclude a new joint-venture agreement, this time with that country's largest vintner, Concho y Toro, to create the premium class Almaviva wine. The first Almaviva vintage was released in 1998, to worldwide acclaim. In that year, Rothschild acquired a new property, Domaine de Lambert, near Saint-Polycarpe, in the Languedoc region. That purchase marked a departure for the company; it was its first vineyard holdings outside of the Bordeaux region. 1853: Nathaniel de Rothschild buys Chateau Brane Mouton. 1855: Chateau Mouton Rothschild is classified as second growth. 1922: Philippe de Rothschild takes over operation of chateau; begins bottling at the chateau. 1924: The first chateau-bottled vintage is released. 1933: The company acquires of Chateau Mouton d'Armailhacq. 1945: The first Mouton Rothschild label featuring artwork appears. 1956: The company is incorporated as Baron Philippe de Rothschild SA. 1959: The Georges Braque label is introduced. 1970: The company acquires Chateau Clerc Millon. 1973: Mouton Rothschild receives first growth classification. 1979: The company begins Opus One joint-venture with Mondavi. 1990: Baron Philippe de Rothschild SA becomes the official company name. 1997: The company launches Almaviva joint-venture with Concho y Toro. 1998: The company purchases Domaine de Lambert. The Weinfreundeskreis Hochheim is a group of wine enthusiasts that was founded in Hochheim in 1979. Franz Kuenstler is one of the dozen or so founding members, along with my wife and me. As somebody from the wine industry, he was in particular helpful, to get the project off the ground and running. 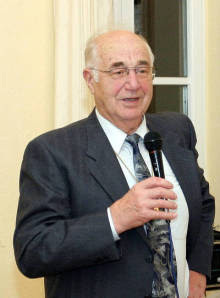 He was awarded an Honorary Lifetime Membership of the Weinfreundeskreis Hochheim on January 29, 2010 in Hochheim. For an article on the evening, see here, in German. For postings on Hochheim and the Weinfreundeskreis Hochheim, see here. 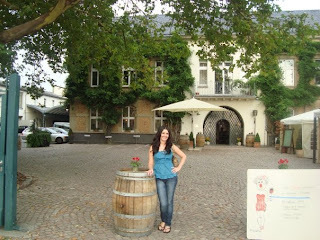 Hochheim is at the eastern edge of the Rheingau, well know around the world for its Riesling wines. Moving from Hochheim to the west, the fairly flat, dimpled landscape evolves into progressively steep slopes. It is a quietly beautiful region, rich in tradition. Queen Victoria's enthusiasm for Hochheim's wines contributed to their popularity in England, where they, and ultimately, Rhine wines in general, were referred to as Hock. The third President of the USA - and notable bon viveur - Thomas Jefferson visited the Rheingau in 1788 and wrote that the wine of the "Abbaye of Johnsberg is the best made on the Rhine without comparison … That of the year 1775 is the best." He also referred to the Rheingau’s Riesling as the "small and delicate Rhysslin which grows only from Hochheim to Rudesheim". Impressed by the quality of the Rheingau Riesling wines, he bought 100 grapevines in Hochheim to take back to his estate in Virginia. The Franz Kuenstler Estate is one of Germany’s world class wine producers. It has 5F’s (out of 5) in the FEINSCHMECKER ranking. The Wine Estate is currently run by Gunther Kuenstler, who took over from his father Franz a number of years ago. The Künstler’s wine tradition goes back to the end of the Thirty Years War when in 1648 they first planted grapes along the river Thaya in South Moravia, an area then in the domain of the Hapsburgs. Franz Künstler, born 1926 in Unter¬ Tannowitz, was forced to take charge of the estate at age 13 while his father was fighting in World War II. After the war, South Moravia reverted back to Czechoslovakia and the Künstlers became refugees in then West Germany. Franz completed his formal education at the wine institute in Württemberg and upon graduation went to work in several wineries. In 1951 he was appointed cellar master and administrator at the Domdechant Werner Estate in Hochheim. He stayed at Werner for 11 years and then started to formulate plans to produce his own wine again. In 1965, he started his own winery in Hochheim. 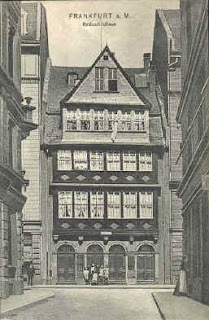 In the following years Franz slowly and diligently worked to build the reputation of his estate. I still have his outstanding 1976er in the wine cellar. After completing his studies, son Gunter joined his father in 1988 and assumed full control of the estate in 1992. After the aquisition of the Aschrott estate, Künstler estate is currently comprised of about 26 hectares with 85% planted to Riesling and 15% to Spätburgunder (Pinot Noir) all in Hochheim. A tiny bit of Chardonnay is planted to be used in the estate sparkling wine. Even though it belongs to the Rheingau, Hochheim is actually situated along the Main river. Its vineyards have amongst the best exposure and climate in all of the Rheingau. It is located in Hochheim, Rheingau, just 30 Minutes away by S-Bahn from Frankfurt am Main central railway station. Coming from Frankfurt, you arrive in vineyards and it is a beautiful walk up the vineyards to the village and the Kuenstler Estate at the village entrance. Weingut Künstler is a member of the Rheingau Charta group and since April of 1994 a member of the Rheingau V.D.P. Gunter Kuenstler is one of the two winemakers of Hochheim who have ventured out to the American market (the other one is Weingut Domchechant Werner), benefiting from the increasing popularity of Rieslings in the US and in general in the world. I have watched it rising from a small winery to one of the world leaders of German wine. See my posting on the recent Kuenstler autumn tasting here. I recently posted an video interview of Hendrik Thoma with Gunter Kuenstler here. Gunter speaks about the new concept of German Grand Cru wines. 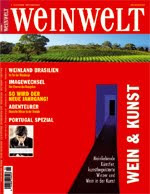 Weinwelt is one of the half dozen or German wine journals, issued by the Maininger Verlag. Every year, they organize the Weinwelt Riesling Award. For the Weinwelt Riesling Award 2009 – the vintage 2008 – 1100 wines were submitted. This is an Estate in the Pfalz with a long tradition and, with 4 Gault Millaut Grapes in the group of 10 Estates in the Pfalz with 4 Grapes, behind Oekonomierat Rebholz, the only 5 Grapes Estate in the Pfalz. David Catoir runs the Estate in the 9th generation. This Estate with 9 hectars is run by the father –daughter couple Konrad and Annette Closheim. Not yet in the Gault Millau, but listed as a candidate for 1 Grape. One of Germany's stars of noble-sweet wines from Franken; one of the three Estates with 4 Gault Millau Grapes in Franken, with no Estate achieving 5 Grapes. A family run Estate with 6 hectares in Hochheim in the Rheingau, not mentioned in the Gault Millau Guide, but I had already heard from friends that Baison is increasingly making interesting wines and I had plans to drop by there the next time I am in Hochheim. Baison also manages the winery of the Catholic Church in Hochheim. The entry wine of the 2 Grapes Gault Millau Estate Porzelt in the one liter bottle. Gault Millau gave the wine only 83 points, but nevertheless, this is the wine I like for the barbecue party Saturday afternoon. Easy drinking, good and inexpensive. You find a complete list of the wines that have gotton awards here. Sonoma Valley is home to some of the earliest vineyards and wineries in California, just a few miles north of San Francisco. The Franciscan missionaries led the way, bringing the Mission grape to make wines for religious services. Cradled between the Mayacamas and the Sonoma Mountain ranges, Sonoma Valley encompasses a rolling patchwork of vineyards, quaint farms and 13,000 acres of scenic parkland, with many famous wineries. Robert O'Maoilriain CSW, a Food and Wine Critic at Sonoma Sommelier Wine and Food Review, has put together an interesting list of his Top 10 Sonoma Valley winemakers. He describes his passion for wine as follows: I am obsessed with wine terroir and have entrench myself in the vineyards, working hard to get to the bottom of wine and vineyard flavors.“Why” is as important as “What” to me in my reporting and reviews. No Wine Critic to date has embedded themselves in their Wine region to the degree that I have. I dig in the soil, taste the grapes, taste the juice, smell the insides of the barrels, meet the workers, sort the grapes, crush and press, fill and top the barrels, walk and photograph the Vineyards, know my Valleys Vineyards blind, most of all I am a reporter in the trenches and on top of the newest details and developments in my district. Instead of noncommittally reporting on World Wine I am a specialist. I will rewrite what the world knows about the Wines of my district. I am onto something here. Please follow my passion, this is not a business. This is my life’s work. Here are his Top 10 Sonoma Valley Wine Makers of 2009 – an interesting selection. Next time, I am over in Berkeley, I will check them out. 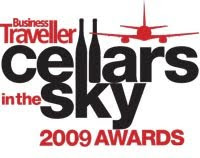 Business Traveller announced on February 9, 2010, the annual Cellars in the Sky Awards, recognizing the best business and first class wines served by airlines worldwide. The big winner this year was Qantas, which walked away with four awards, for Best First Class Red Wine, Best First Class Fortified / Sweet Wine, Best First Class Cellar, and Best Presented Wine List. The airline's haul also helped Oneworld come out on top in the Best Alliance category. Cathay Pacific won two awards for its business-class offerings, triumphing in the Best Business Class Red Wine and Best Business Class Cellar categories, and Lufthansa also bagged two awards, for Best Business Class Fortified / Sweet Wine, and Best First Class Sparkling Wine. For a full rundown of the results, click here. Commenting on this year's entries, TV wine presenter and co-chairman of the International Wine Challenge Metcalfe, one of the judges, said there had been some pleasant surprises, with a number of unusual choices, perhaps reflective of the economic situation. "Airlines are having to be more creative with their wine choices," said Metcalfe. "Rather than choosing an expensive and well-known label, they are choosing lesser-known but much more interesting wines." The Business Traveller Cellars in the Sky Awards have been running since 1985, with 34 airlines taking part this time round: Aer Lingus, Air Astana, Air Baltic, Air Canada, Air New Zealand, Alitalia, American Airlines, ANA, Austrian Airlines, Bmi, British Airways, Brussels Airlines, Cathay Pacific, Delta, Emirates, Etihad Airways, Finnair, Gulf Air, Iberia, Japan Airlines, Jet Airways, Kenya Airways, KLM, Korean Air, LAN, Lufthansa, Mexicana, Qantas, Qatar Airways, SAS, Singapore Airlines, South African Airways, TAM Airlines and US Airways. John Abbott, winemaker at and co-owner of Washington State’s Abeja winery presented his wines in the greater Washington DC area this week, including at Out-of-Site Wines in Vienna, Virginia. About half a century ago, there was basically no wine industry in Washington State. And if wine was made, it was not with the noble European vinifera grapes. But the American wine boom that had its origin in California moved to the north, first to Oregon and then it also reached Washington State. In 1980, four years after Californian wines had out shined the French wines at the famous tasting in Paris, there were about 20 wineries in Washington State that were producing high-quality wines with European vinifera grapes. Today, there are more that 650 wineries. More than half of the wine produced in Washington comes from wineries owned by Chateau Ste. Michelle. One of the wines is Eroica, which is made in collaboration with Dr. Ernst Loosen, the eminent Riesling producer from the Mosel region of Germany. Eroica was launched in 1999. Named for Beethoven’s Third Symphony, Eroica is supposed to reflect not only its variety and site, but also its heritage: bold and forward from its Washington roots, elegant and refined from German inspiration. They make three kinds of the Eroica, the regular, dry Eroica, an ice wine and a Single Berry Selection. The latter is made in the traditional German Trockenbeerenauslese style, for which the Mosel valley is so famous. See here. Another of the Chateau Ste. Michelle wines is the Columbia Crest 2005 Reserve Cabernet Sauvignon, which the Wine Spectator magazine, one of the most influential wine publications in the world, has named as the No. 1 Wine in the World for 2009. See here. The remainder - about 40 percent - of Washington State wine is produced by the other 600 wineries, which are mostly small artisanal family enterprises typically producing 2000-3000 cases, in some cases up to 20,000 cases or more. The Seattle Wine Blog has just released its fourth unofficial ranking of the top Washington State Wineries, following the example of the Bordeaux Classification of 1855 with 5 groupings. In the top grouping - First Growth – you find three wineries (Cayuse, Leonetti, Quilceda Creek); in the second grouping – Second Growth - there are 8 wineries (Andrew Will, Betz, Cadence, DeLille, Januik, Long Shadow, Pepper Bridge); in the third grouping – Third Growth – you find Abeja with about twenty other wineries. The Fourth and Fifth Growth groupings contain another 70 wineries. See here. 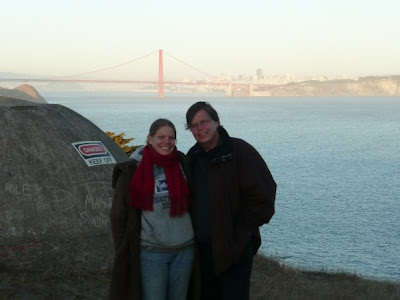 It all began 35 years ago, when Ken and Ginger Harrison from Portland, Oregon, decided to embark upon a new adventure. John Abott and his companion in life and work Molly Galt joined the Harrisons in 2002. John began his career in the Napa Valley, when, as a new college graduate, he went to work first for Pine Ridge and later for Acacia Winery. In 1994, he and Molly moved to Walla Walla to begin Canoe Ridge Vineyard. Picture: Abeja's Wine Maker John Abbott and Out-of-Sight on-site owner Steve. In general, if California’s wines are rich and powerful, Washington State’s wines are more crisp and delicate, reflecting its location much more up in the North. The Abeja wines reminded me a lot of the wines I know from Germany and France. The wines were light and elegant, not big, dense and concentrated as those from warmer regions. Three different strains of yeasts are used during barrel fermentation. The wood is half new and half on-year-old French oak. Aging sur lie for 10 months, 13.8% alc. Medium straw color in the glass with nice legs, hints of vanilla, cucumber, celery and muskat on the nose, a full-bodied wine, lots of eucalyptus and tee leafs on the palate, coupled with lychee and white peach aromas, the finish is long and bright with wet stone lingering on the palate, an elegant and feminine Chardonnay. Aged for 16 months in 90% French, 5% Central European and 5% American oak, of which 60% is new oak. 91% Merlot and 9% Cabernet Franc. 14.6 % alc. A brilliant medium light red color in the glass, with thick legs, the nose is Old World style with maraschino cherries, plums and fruitcake aromas, a full-bodied wine, dark chocolate and more maraschino cherries on the palate, with some Madagascar vanilla, long lasting finish with silky tannins and a hint of tobacco. All French, medium toast oak, with 60% new oak. 82% Cabernet Sauvignon, 14% Merlot, 4% Cabernet Sauvignon, 22 months barrel aging. 14.9% alc. Medium-dark in the glass with thick legs, nose of dark berry fruits, earth, spice and herbs, a full bodied wine, with dark chocolate, pain grille and plum on the palate , long balanced finish with modest tannins, wood is not telling the story of this wine. 97% Syrah and 3% Viognier, 50% French, 40% Hungarian and 10% American oak, of which 20% new. 13 months aging in large barrels. 14.5% alc. Medium dark ruby color in the glass, with convincing legs, attack of dens black cherries, coupled with smoked meats on the nose, a full-bodied wine, in the mouth a sensation of dried flowers, floral lavender blossoms and wet stone, a complex and balanced wine reminding me of the classic Northern Rhone wines, different from the wines of warmer regions. 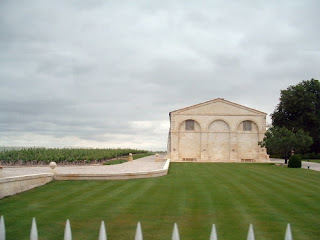 Château Mouton-Rothschild in Puillac, Medoc, is the crown jewel of the world wide wine empire Baron Philippe Rothschild SA. Baron Philippe, who died in 1988, belongs to the London branch of the large Rothschild family, which has its roots in the ghetto of Frankfurt am Main, Germany, in the 18th century in the home of Mayor Amschel Rothschild. He was a money changer, not allowed to purchase land outside the ghetto, but he sent his sons out into the world. During the 19th century, his five sons and their families became a major force in the far reaching changes that swept through Europe. They became the bankers to monarchs and governments and and contributed to the industrial revolution through their investment in railways. They became one of the richest, if not the richest, familie(s) in the world. Each year the esteemed French wine house chooses a master artist to create a label. This year's offering, the 2007 vintage, features an artist with less name recognition, Bernar Venet. His label features a sketch of a sculpture forming two graceful upward arcs. He is a French sculptor known for his curvy steel outdoor sculptures. The custom of having an artist design each year the label of the Mouton Rothschild wine goes back to the year 1924, when Chateau Mouton Rothschild was ready to release its first vintage bottled at the Chateau itself. Until then, wineries sent their wine in casks to wine merchants in the city of Bordeaux, who then undertook the responsibility of stocking the casks for the two-year aging process, before bottling the wines. Although labels had been in use since the middle of the 19th century, they served merely to provide basic information about the wine contained in the bottle--or what, at any rate, was supposed to be in the bottle. Rothschild commissioned for the occasion the popular poster designer Jean Carlu to design a label. Carlu's cubist-inspired label shocked the wine community--Philippe Rothschild was to scrap the label design only two years later--but nonetheless succeeded in calling worldwide attention to the new era of Rothschild wines. In the years leading up to the World War II, the Rothschild chateau continued to experiment with its wine labels. In 1955, the Rothschild label took on a still more serious role. That year's label featured a design from famed painted Georges Braque. From then on, the Rothschild labels were to become a showcase for the world's top contemporary artists, featuring, among others, drawing and paintings from Joan Miro, Salvador Dali, Henry Moore, Marc Chagall, Pablo Picasso, Andy Warhol, and later artists such as Keith Haring, Balthus, and others. 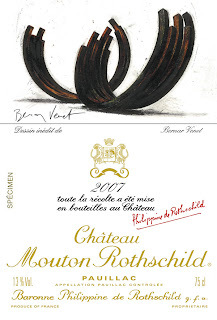 Last year Château Mouton-Rothschild opted for artist Lucien Freud to have the honor of appearing on its famous label. 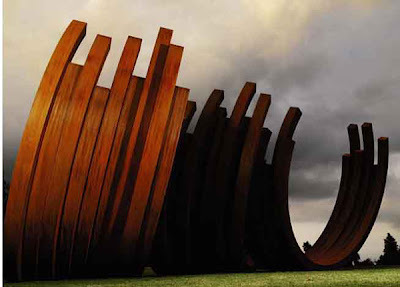 This year's artist Bernar Venet was born in Château-Arnoux-Saint-Auban (Alpes de Hautes Provence, France) in 1941. He studied in Nice. His work explores many media, materials and forms of expression. 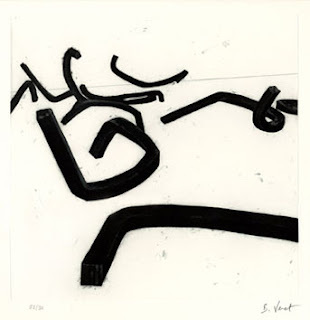 From the early sixties, Venet's use of industrial drawings and mathematical diagrams in painting has been a major contribution to Conceptual Art. Venet has lived in New York for many years, and practices as an artist around the world. For Venet, being an artist means not only painting or sculpting, but also to speculate--in art, science, philosophy, mathematics, geometry, and music. He is an internationally recognized painter, sculptor, and composer of concrete music (technologically manipulated sound), and his main interest in art is to raise questions, to push his work further and further, and to search for new approaches. This wine made by Mirjam Schneider is a very special wine, for several reasons. It is a red wine. Germany is traditionally a white wine country. But German red wines are increasingly appearing in the international wine market. Of course, given its location, they tend to be not like the fruity red wines we know from warmer countries, but lean and more elegant, with a lot of finesse. 30 years ago, in the international scene, people would not talk about German red wine. But this has changed. Germany now produces red wines that can compete with the best of the world. The share of red wines in terms of production has increased from 10 percent in the 1980s to about 35 percent now in Germany. It is a Merlot. Until a few years ago, Cabernet Sauvignon and Merlot were grape varieties that Germans would know from Bordeaux or other wine regions in the world, but it was alien to German wine making. This is apparently changing. Well, the story behind this is global warming. The head of the wine maker association in the Bourgogne has warned that in 50 years, there wouldn’t be any Pinot Noir wines from the Bourgogne any more. But we might have excellent Cabernet Sauvignon and Merlots in the Rheinhessen region. In this global warming process, there will be winners and losers. And the concept of terroir will lose its meaning, I fear. Merlot is one of the most popular red wine varietals in the world. It is estimated to be the third most grown variety at 260,000 hectares globally, with an increasing trend, behind Chardonnay and Cabernet Sauvignon. France is home to nearly two thirds of the world's total plantings of Merlot, where it is one of the primary grapes of Bordeaux wine. It is particularly prominent on the Right Bank of the Gironde in the regions of Pomerol and Saint-Emilion where it will commonly comprises the majority of the blend. One of the most famous and rare wines in the world, Château Pétrus, is almost all Merlot. In California, Merlot can range from very fruity simple wines to more serious, barrel aged examples. I have also had some excellent Merlots from Long Island on the East Coast. It is a wine from Rheinhessen – an area that used to be known for winemakers often focusing on quantity and not quality. Rheinhessen is the largest viticultural region in Germany. Every fourth bottle of German wine comes from Rheinhessen. The high-yielder Mueller-Thurgau accounts for about 1/5 of the vineyards. Unlike in other German wine regions, where monoculture of the vine is the norm, here the many rolling hills are host to a wide variety of crops grown alongside the grape. Rheinhessen also has the rather dubious honor of being considered the birthplace of Liebfraumilch. At the same time, Rheinhessen is among Germany’s most interesting wine regions. A lot is happening there. This is not because of the terroir, but because of the people. There is an increasing group of mostly young and ambitious winemakers who want to produce and indeed do produce outstanding wine and not wines in large quantities. Mirjam Schneider is one of them. Mirjam Schneider sells this wine as “Lagenwein”. What is Lagenwein? Along with other winemakers, she is moving away from the classical German wine classification and has established her own quality standards. She groups her wines into 3 categories: Gutsweine (***), Ortsweine (****) und Lagenweine (*****). All wines, by law, need to be classified according to the 1971 German Wine Law. All the Schneider wines are classified as Tafelwein or QbA, according to the classical German wine classification system, and thus they can be chaptalized. But the QbA on the label of this wine is meaningless and confusing. This Merlot was at the Auslese level at harvest. And it was chaptalized a bit to increase the alcohol content. It is a bone dry wine. A top level wine. The Schneider Estate in Hechtsheim at the outskirts of Mainz looks back to a long winemaking tradition. Already since 1715 the Schneider family has grown and made wine. Mirjam Schneider, a young lady in her 20s is the 6th generation. She has split up the work with her father, Lothar Schneider, who looks after agriculture, while she is responsible for the viticulture and the wine making in the cellar. In the farm shop of the Schneiders, you will find both fresh fruits and vegetables and wines from Mirjam's cellar. Because of this Merlot, but also because of her other wines, Mirjam Schneider was awarded one grape by the prestigious Wine Guide Gault Millau in 2010 and thus is now member of the group of winemakers on the Gault Millau list. - the grapes were harvested on October 6, 2007. At harvest, the grapes had a sugar content of 99 degrees Oechsle; this is Auslese level. - to increase the alcohol content , the wine was chaptalized by 1.5 percent in terms of alcohol, as a lot of alcohol is lost during the tradional mash fermentation. The Gau-Bischofsheimer Kellersberg is a south facing slopes vineyard with a sandy loess-loam soil. As its ground warms quickly, it offers Pinot Noir and Merlot optimal conditions. Tasting Notes: Dark ruby red in the glass, tight legs, attack of cassis on the nose, with leather and charcoal, coupled with toned down vanilla, full-bodied wine, good firm tannis, good structure on the back, long spicy and hot finish. An attractive old world Merlot. I give the wine 89 points. Drinking Wine in Vancouver during the Olympic Winter Games: Why not Go South to Washington State? 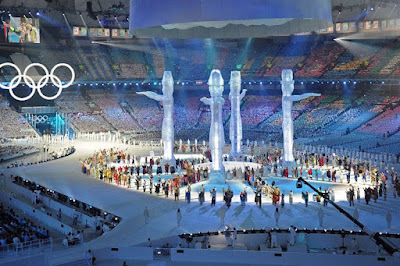 300.000 people are expected to come to Vancouver to visit the Olympic Winter Games. If they want to drink wine, the first choice, I would think are wines from British Columbia. If a gold or other medal needs to be celebrated, perhaps a Canadian icewine from the Niagara area is the best choice. I have talked about this in my posting of February 14 here. Looking south, there is also Washington State in the US with its wonderful wines. About half a century ago, there was basically no wine industry in Washington State. And if wine was made, it was not with the noble European vinifera grapes. But the American wine boom that had its origin in California moved to the north, first to Oregon and then it also reached Washington State. In 1980, four years after Californian wines had out shined the French wines at the famous tasting in Paris, there were about 20 wineries in Washington State that were producing high-quality wines with European vinifera grapes. Today, there are more that 500 wineries. In general, if California’s wines are rich and powerful, Washington State’s wines are more crisp and delicate, reflecting its location much more up in the North. They remind me a lot of the wines I know from Germany. Wine adviser Paul Gregutt from the Seattle Times has published his Top 100 Wines of Washington State for 2009. This ranking is not done strictly by the points the wines received from Paul Gregutt in the tasting, but also takes the price into account. Here are Paul Gregutt's Washington State Top 100 Wines for 2009. I was happy to see that there are two wines on the list, which are American/German wines. This is the result of a American/German joint venture, a collaboration between Chateau Ste. Michelle, the huge Washington winemaker, and Dr. Ernst Loosen, the eminent Riesling producer from the Mosel region of Germany. The wine is made at Chateau Ste. Michelle from grapes grown in the Columbia Valley. Long Shadows has become, in a short time, one of the premier wineries in Washington State . It is an unusual set up. Former Stimson-Lane CEO Allen Shoup works with renowned winemakers from around the world for this venture. Each winemaker creates a single wine using Washington fruit. Add resident winemaker Gilles Nicault to shepherd all of the wines along. The Poet’s Leap Riesling is made by Armin Diel, one of Germany’s most highly regarded Riesling producers. In the week leading up to the opening of the Olympic Games in Vancouver, Paul Gregutt also did a quick tour of the 5 most essential varietals grown and made in Washington State. He started with the Riesling, here, and continued with Semillion, Merlot, Cabernet Sauvignon,Chardonnay and Syrah here. A very useful introduction. Last but not least, the Seattlewineblogger has just released his fourth annual Unofficial Classification of Washington State Wineries. 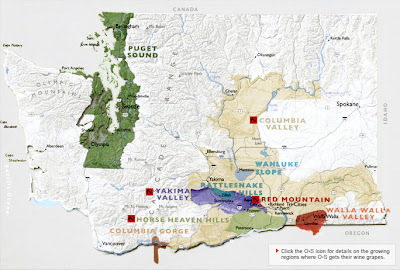 "The 2009 Unofficial Classification Of Washington State Wineries represents my personal, perhaps, idiosyncratic or eccentric, opinions of the quality of Washington State wineries. Out of more than 650 wineries, there are at least a hundred producing great wine. About half of the wine produced in Washington comes from wineries owned by Chateau Ste. Michelle. The other 600 some odd wineries are mostly small artisanal family enterprises typically producing 2000-3000 cases, in some cases up to 20,000 cases or more...In contrast to other classifications of wine such as the 1855 classification of Bordeaux, the Unofficial Classification of Washington Wineries is not set in stone and changes every year...This has been a difficult year with so many people unemployed, retirement funds cut in half, and a housing market that is limping along at best. In general, it appears that most people have lowered the price they are willing to pay for a bottle of wine, but have not cut consumption. Wines at the top of the list be special wines for special occasions, whereas wine in the "Cinqieme" group tend to be outstanding values...Wineries are listed in alphabetical order and not ranked within each category." Here is the Unofficial Classification of Washington State Wineries. Thank you for this effort. We had a couple of snow storms in Washington DC the past few days. The TV stations were constantly updating viewers about the changing conditions around the region and were inviting viewers to communicate with the TV station via facebook, twitter or Ustream. tv. Just having spent 2 months in Germany, I thought ..wow, where facebook and twitter are only now starting to take off. But social media are taking off in Germany and this is, among others, affecting the wine industry. I reported on the use of twitter by German winemakers a few days ago. See here. Today, I will report on 4 web wine shows. 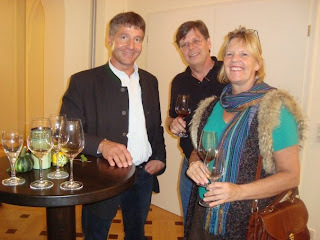 Patrick Johner organized a twitter wine tasting on Ustream.tv with a Skype connection to his father in New Zealand on February 8, 2010. The next twitter wine tasting is scheduled for later today, at 8:30 pm CET. Father Karl H. Johner and son Patrick Johner produce wine both in Baden, Germany and in New Zealand, and this at the highest level, as indicated by their 3 Gault and Millau Grapes. First, there was Patrick Johner sitting in the office of his winery in Baden, Germany, behind a monitor and with a head set on his head. He was orchestrating the whole show and broadcasting through Ustream.tv. Ustream.tv, established March 2007, is a website which consists of a network of diverse channels providing a platform for lifecasting and live video streaming of events online. It is not yet well known in Germany, but during the 2008 United States presidential election, the website was used by nearly all the main candidates to help their campaign. Ustream.tv is one of several life video sites that exist now, including Justin.tv, Livestream and Blogstar. Ustream's basic service is still free and supported by advertising revenue. Second, Patrick was connected via Skype with his father Karl H. Johner in New Zealand, who was also on-line. During the show, with his lap –top, connected to Ustream.tv via Skype , Karl H. Johner was first walking in the vineyard showing us the grapes, then showing us his cellar and finally also drinking the wine, while commenting on questions and remarks. Amazing pictures! Third, there were the viewers like me. Many of the viewers had ordered the wine before the show and were tasting with Patrick Johner and his father the Sauvignon Blanc from New Zealand. The viewers were watching and hearing the father in New Zealand in one window of the screen and Patrick in Baden in another window. Next to the window on Ustream.tv, there was a box to send text messages. But most viewers used their twitter account . They were all in their twitter accounts and sending out notes and questions via twitter with the hashtag #twv , which means in German twitter wein verkostung. We were all reading the tweets, including Patrick Johner. He would select the more interesting ones and share them with his father. Then, his father would answer from New Zealand or Patrick would answer from Germany. Fourth, I was one of the viewers, currently in Virgina, US. I saw and listened to Patrick Johner in Germany and Karl H. Johner in New Zealand. I found it fascinating to taste the wine and then be able to interact with the wine maker who himself was moving around in the vineyard and wine cellar, where the wine was made, many thousand miles away from me. The Twitter/Skype/Ustrem.tv set up allowed an intensive dialog with the winemakers on the wine and any other question. You just had to tweet it. This was a real-time, one-man show, low-budget and truly international through the Skype link to New Zealand. Hendrik Thoma, the former wine sommelier and now one of the leading German wine journalists, in collaboration with the wine retailer giant HAWESKO, has launched the internet TV series TVINO a few months ago. TVINO is the German version of Gary Vaynerchuk’s show. There are on average three shows per week. With the backing of HAWESKO, they are very professionally done. In contrast to Patrick Johner’s show and Dirk Wuertz’s show (see below), Hendrik is just the show master – but a very entertaining one - and everything else is taken care of by the HAWESKO crew. Also, TVINO is produced ahead and then broadcasted, it is not real-time streaming. He either does the show by himself, reviewing a couple of wines or he has guests and tastes wines with them. The guests have always been very interesting and have included such giant wine makers as the Antinori brothers from Italy, the German top wine maker H.O. Spanier from the Battenfeld Spanier Estate in Rheinhessen, and even the French actor and super star Gerard Depardieu, who also produces wine. As a backdrop, the show is not interactive. However, what one can do is to buy the wine (and this is the main purpose of the show) and taste the wine by oneself, letting the video stream again. TVINO is a marketing event, but Hendrik Thoma does it in a very civilized and entertaining way. Hendrik Thoma has also launched a Smile2 wine tasting, which is inter-active and real-time, a bit like the Johner show. You were able to send text messages and Hendrik would read them and comment on them. You could watch Hendrik with his head set and the very helpful power point slides he had prepared for the show. He would react to the text messages, when the tweets came. This show, like the TVINO, is backed by a professional company. Indeed, the show was introduced and orchestrated by a show master of Smile2. You had to sign up with Smile2. This time, they did not charge anything, but I suspect that if the show continues it will not remain free of charge. Smile2 GmbH is a German company that specializes in internet seminars and meetings. The tasting was a live, real-time online event with one of Germany’s top wine experts, who is always fun and knows so much about wine. Last but not least, Dirk Wuertz launched 100 Grad Oechsle in January 2010. This was the first private internet TV show on wine in Germany. Dirk Wuertz is an enigmatic wine maker from Rheinhessen in Germany. In his wine cellar, he is focused on sustainable agriculture. The wine making philosophy is one of minimal intervention by means of fermentation with natural yeasts and limited pumping, fining, or filtration. Wuertz – Weinmann export a large part of their production to the US. Inter alia, their wine is served at the New York City top wine bar “Ten Bells” in lower Manhattan. I have reported about this here. Dirk Wuertz is also one of the leading figures in Germany’s wine blogger scene and the second most active tweeter, in terms of followers, after Johner. Dirk Wuertz has produced one show so far and the second one is already scheduled. This was a major undertaking, a great, traditional 90 minutes TV show, but homemade at the winery by Dirk Wuertz himself and a couple of his friends. Like in a traditional TV show, there were special guests talking with Dirk - a prominent TV star and a biodynamic farmer; there was an audience that also at some point was asked to participate in the show and review a wine. This was obviously a major undertaking by Dirk Wuertz and his friends. They all did it for fun, to be there when the internet is taken to new heights. It was not interactive with the viewers, but I imagine that this can be done easily. It was like a TV show we know from traditional TV on wine, but homemade, with a low budget and lots of enthusiasm of the producers. We are in the early stages of understanding which of these digital wine ideas will catch on and which not. Time will show. In the meantime, I suggest that you, Johner, Thoma and Wuertz look into the new world that is opening up with a new, revolutionary USB stick developed in France, which allows to integrate the Web 2.0 with the actual delivery of wine. See the (funny) video here.